By Niall Byrne | February 21, 2018. 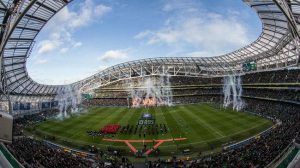 Ireland beat Italy 56-19 at the Aviva Stadium on Saturday afternoon, to earn themselves a bonus point victory and climb to the top of the table. Ireland had the bonus point wrapped up by the 35th minute of the game, with tries from Robbie Henshaw, Conor Murray, Bundee Aki and Keith Earls. It was Bundee Aki’s first try in an Irish jersey, on his third cap. With Italy hardly putting an impression on the game, the half time score was 28-0 and the second half started in the same fashion as the first. Henshaw stole the ball in the Italian’s half and raced over for his second try of the game. However, he injured his shoulder in doing so and was replaced by newcomer Jordan Larmour. With Rory Best bundling himself over for Ireland’s sixth try, Italy finally got on the scoresheet with Tommaso Allan’s first of three tries. The two other scores were by Edoardo Gori and Matteo Minozzi; mere consolation. Jacob Stockdale got two more tries for Ireland, his second rounded off the game with a brilliant 70 metre sprint. The win keeps Ireland’s Grand Slam ambitions alive with England being the only other team eligible to win the Grand Slam. A tougher test is expected as Ireland play Wales next at the Aviva Stadium on Saturday 24th of February.